In this episode, Jay is joined again by Mz. Word to address the question: Are men valued in today’s society as much as they should be? 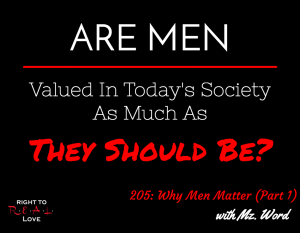 Are men valued in today’s society as much as they should be? What factors have had the greatest impact on the way people value men? Why we must stop devaluing men. The danger of thinking a man’s only roles are to provide and protect. How the roles of men and boys have changed over the years. The importance of teaching children the right things. How some parents have become lazy and have no desire to teach their children. Press the colorful buttons below and SHARE THIS LIKE CRAZY!! !